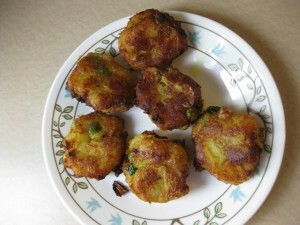 Breaded Meat And Aloo Balls recipe by Farzana at DesiRecipes.com. Already prepared mince meat 1 cup. dhaniya powder 1/2 a tsp. ginger /garlic paste 1 tsp. Cook mince meat with salt , crushed pepper, zeera , dhaniya powder and ginger garlic paste and a cup of water in it. Fry the meat when water dries. Mix a pinch of zeera in the potatoes. Make small round balls of the keema pressing the balls to make them hard. Now cover them with a layer of mashed potatoes. Make into a ball. dip it in the egg white covering whole ball and then dip it in a bowl of bread crumbs. Cover whole ball with the crumbs then fry until nice and brown. Serve with chutney of your taste.